Use the Napoleon Commercial Grade Rotisserie Kit for Extra Large Grills to produce restaurant quality meals right in your own back yard. The large commercial grade stainless steel hexagonal spit rod with commercial motor (holds up to 55 lbs of food) are up for any task you throw at them. The stainless steel four prong meat forks hold your food in place with easy to use thumb screws. And there is even a counterweight assembly, just in case you're cooking for an army. Use the Napoleon Heavy Duty Rotisserie Kit to produce restaurant quality meals right in your own back yard. The large stainless steel square rod with heavy duty motor are up for any task you throw at them. The commercial quality meat forks hold your food in place with easy to use thumb screws. And there is even a counterweight assembly, just in case youre cooking for an army. Rotisserie grilled meals are the best. They are succulent and juicy and a real crowd pleaser. Use the Napoleon Heavy Duty Rotisserie Kit to produce restaurant quality meals right in your own back yard. The large commercial grade stainless steel spit with heavy duty motor are up for any task you throw at them. The commercial quality meat forks hold your food in place with easy to use thumb screws. And there is even a counterweight assembly, just in case you're cooking for an army. Kitchen Aid Natural Gas BBQ Conversion Kit is rated 4.0 out of 5 by 134. Rated 5 out of 5 by Sandy from Our KitchenAid grill is working great!... Our KitchenAid grill is working great! Hello SSAES, my name is Jaclyn on behalf of Nexgrill. 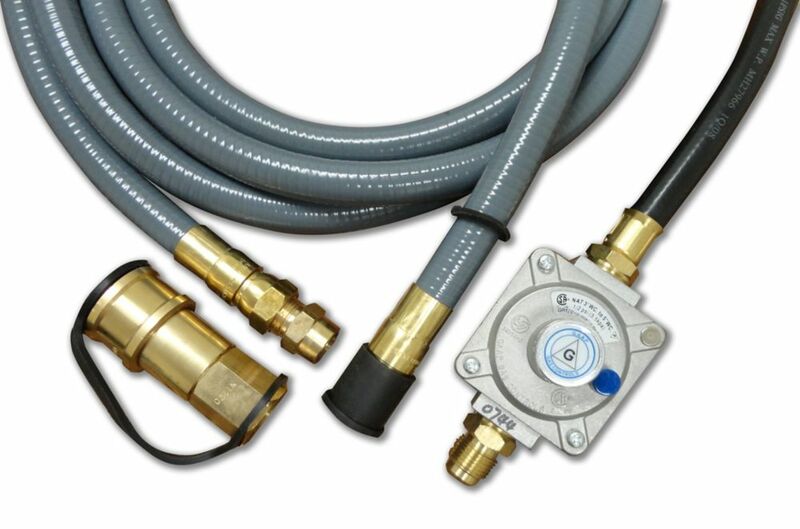 This kit is intended to be used with our BBQ units that are convertible to Natural Gas. You may want to contact the manufacture for your fire table to confirm this item will work properly on your unit. I hope you have a Great Day and Happy Grilling! Can you please confirm that the conversion kit #710-0003 is the correct part for Kitchen Aid model 720-0954A. In the description on the BBQ, it states this part #, however the description on the part number does not include reference to the correct BBQ. Hello Hayley, My name is Jaclyn on behalf of Nexgrill. Yes, this is the correct kit to convert your unit. I hope you have a Great Day and Happy Grilling! Hello KAS22, My name is Jaclyn on behalf of Nexgrill. This kit is intended to be used with our Kitchen Aid and Nexgrill units. You may want to check with your manufacture of your grill to confirm it will work properly. I hope you have a Great Day and Happy Grilling! Does it also work for Nexgrill Evolution (2-Burner) Infrared Plus? If not, what should I buy..? Hello Jerome, My name is Jaclyn on behalf of Nexgrill. Yes, this kit will work on your unit. Make sure to follow the conversion instructions in your owner's manual for the grill. I hope you have a Great Day and Happy Grilling! Hello Terry cook, my name is Jaclyn on behalf of Nexgrill. We do sell a Nexgrill conversion kit model 710-0008 that will work with this unit as well. Feel free to contact our parts department at 866-601-5799 to have a order placed. I hope you have a Great Day and Happy Grilling!